Since 2010, an evening Potluck Cooking class takes place three nights a week at Community Living Skills. The class is mainly for individuals supported in Community Living Kirkland Lake’s Supported Independent Living Program and it gives them an opportunity to improve their basic cooking skills, lets them try new foods and provides them with a way to sit down and enjoy a meal with a group. 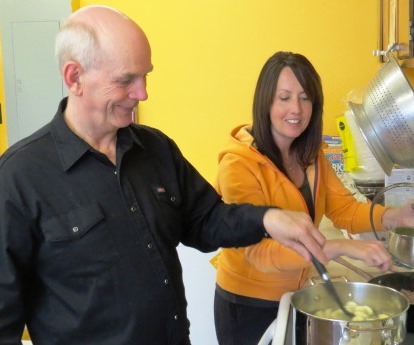 CLS Instructor, Sherry Fraser assists Rick Bassett with this week’s meal, tortelinni primavera. Sherry Fraser teaches the Monday class and her group has relatively unchanged since it started. She says that their skills have improved greatly and they take initiative to complete their tasks and are very motivated and efficient. “These classes are about more than just learning to cook. We plan our menus, make shopping lists, cover safe food handling and cleaning responsibilities.” Social interaction and manners are also strong components of the class. 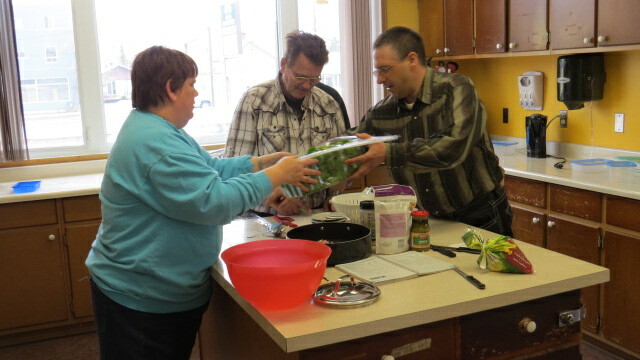 Sherry Shelp, Floyd Hack and Bobby Drury work together in the CLS Potluck Cooking class. Bobby Drury says he looks forward to cooking every Monday because he likes the way Sherry teaches them and they all have known each other for a long time and this gives them a chance to get together once a week. He also says it helps when we have to cook for ourselves at home. While the food is cooking, the group sits down and plans their meal for the next week. The participants bring their own meal suggestions and recipes and then discuss what would go well with the main dish they select. They then use cook books and the internet to research new recipes. The group plans the menu for next week. Once the menu for next week’s class is decided, a shopping list is made. Items are divided up and each person gets their own personal list of groceries to bring to next week’s class. Community Living Kirkland Lake would like to thank the following local businesses and organizations for their generous donations toward our van fundraising efforts. Your contributions will enhance the services we provide to the individuals we support! 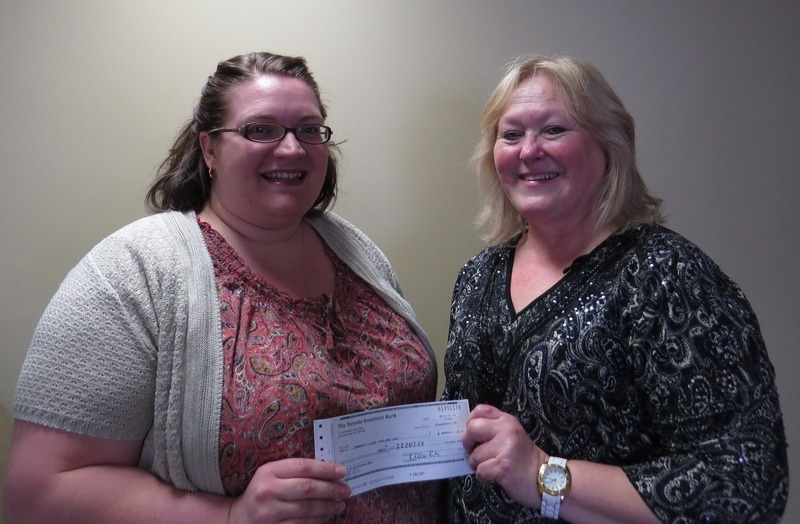 Jamie Cowie, left, presents a cheque for $1120 to Lauri Lambert, Director of Community Development for Community Living Kirkland Lake. The cheque is for money raised at the 2nd Annual Home Based Business Expo held at Hockey Heritage North in April. In a presentation to Kirkland Lake Town Council, Community Living Kirkland Lake requested that the month of May be declared Community Living Month. Sherry Shelp, on behalf of Community Living Kirkland Lake addressed Council at their meeting on May 7, requesting the declaration and asking if council would agree to fly the Community Living flag at Town Hall for the month. She also thanked the town’s Works department for flying flags throughout the downtown core for the month. “One of the key messages that Community Living organizations throughout Canada advocates for is that of citizenship. Citizenship is about experiencing human rights, responsibilities, and opportunities.” Shelp said in her address. Kirkland Lake Mayor Bill Enouy thanked Shelp for her presentation and said they were pleased to make the declaration. Other members of council commended Community Living Kirkland Lake on the important role they play for the individuals they support. May is Community Living Month every year throughout Canada. It raises awareness of the progress that has been made in Canada to provide meaningful supports and services and to promote social inclusion for individuals with an intellectual disability. Community Living Kirkland Lake has a number of events planned for the month. Each year, a book is donated to the Teck Centennial Library. The book usually carries the theme of intellectual disabilities or social inclusion. This year’s book will be “Carly’s Voice”, the story of a Toronto girl diagnosed with severe autism who has learned to communicate through the use of assistive technology. An annual basketball game between Special Olympians and the Kirkland Lake OPP is slated for May 24 at 7pm. This takes place at St Jerome School and nonperishable food donations would be appreciated for the Kirkland Lake Food Bank. On May 25, a Special Olympics “Have-A-Go” event will be held in the KLDCS gym. It takes place from 1-4pm and will give younger Special Olympians the chance to try out some Special Olympics sports. The gym will be divided into 4 stations and with the help of Kirkland Lake Ineract, participants will “Have-A-Go” at basketball, indoor bocce, bowling and Rocks & Rings curling. 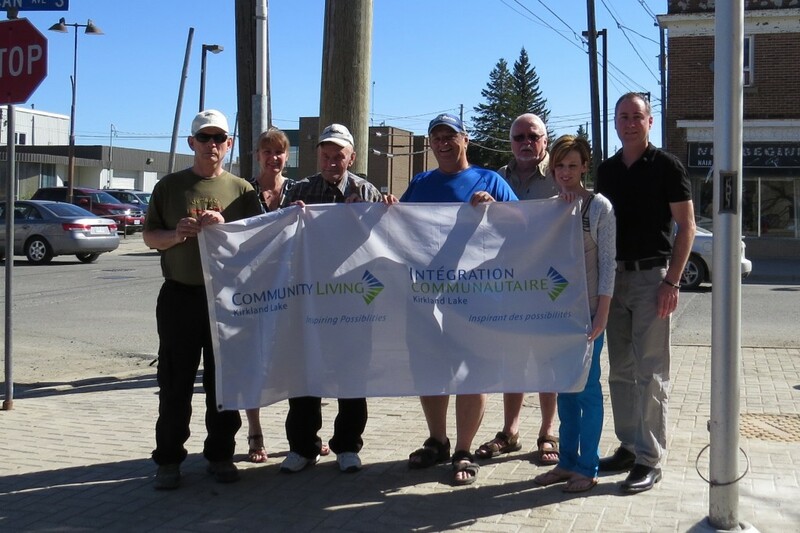 Community Living Kirkland Lake has also recently launched a new web page, Facebook page and twitter account. All of these can be accessed through the website at www.communitylivingkl.com. Throughout the month of May, trivia questions will be posted to the Facebook page. Answers to these questions can be found on the website. The first person to post the correct answer to these questions will win the prize for that day. Prizes include golf umbrellas, travel mugs, a $25 grocery card and a $25 gas card. All winners will be entered in a draw for the grand prize, a Kobo Vox eReader that will be given away May 31. To be eligible, a person must ‘Like’ us on Facebook and they are only able to win once. For more information on any of these events, feel free to contact Jim Fox, Community Support Supervisor, 705-567-9331, ext.222.